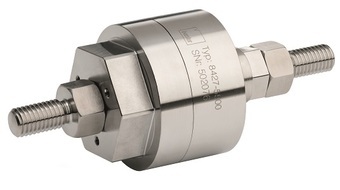 Available in the UK with full support from Ixthus Instrumentation Ltd, the 842 series tension and compression load cell from the German manufacturer burster GmbH offers nine measuring ranges from 0 … 20 N to 0 … 10 kN and is available with a choice of fixing options for maximum application flexibility. Its rapid response to fast force measurement events is especially suited to high-throughput automation tasks such as robot assembly where its compact size allows easy integration for multi-tool systems. Bursters’ 8427 load cell measures tension or compression force between axially mounted metric internal threads at either end of its cylindrical housing which includes a hexagonal flange for spanner mounting. With a full-bridge strain gauge membrane type sensor element the compact unit has a welded high-strength stainless steel construction for maximum durability and IP68 class protection rating. Optionally available threaded inserts may be used or other adapter parts such as eye brackets for cable/chain mounting or load pins for direct axial measurement. These adapter options combine with a good price/performance ratio to expand the application range across laboratory, industrial or safety related load measurement tasks. The sensor electronics requires stable excitation with a rated value of approx. 1.2 mV/V with non-linearity of 0.5% over a -30 ... +80 °C operating temperature range. Excitation is 5V DC and electrical interfacing is made easy with a Mini PG screw connection that is radially fed from the housing via a shielded PTFE cable that is drag chain qualified. A standard calibration is available or the unit can be supplied with burster’s TEDS which allows plug & play connection with sensor specific data stored in the sensor for automatic configuration for faster set up. As with all burster sensors, DAkkS and factory calibration certification is available on request. The compact load cell measures just 30 mm in diameter for the smallest load range with a nominal housing length of only 16 mm. For the 10 KN range diameter is 50 mm and length is 32 mm. The sensors feature internal threads (M4 or M10 respectively) for mounting with an external thread accessory available. The 8427 is part of a wide range of load, force, torque and displacement sensors designed and manufactured by burster, which are supplied and fully supported by Ixthus Instrumentation. The range also includes process control instruments, amplifiers, panel meters and other instrumentation components that allow complete system solutions from a single source. Further information about burster products and other specialist measurement products and services from selected distribution partners is available from info@ixthus.co.ukor by visiting www.ixthus.co.uk.